Through the art of collage and the inspiration of our whimsical footstools with shoes, participants can express and create their happy "sole" centers. In these fun workshops, participants use magazines, photos, found objects, and "bling" to make a paper collage around a shoe design; the result is whatever makes one's heart "zing." We continue to uplift and inspire through a traveling exhibit of our beloved FootsieStools — more than 20 whimsically decorated footstools with shoes — done in highly detailed collage with baubles, bling or whatever makes our hearts zing! Length of exhibit varies. Please visit our gallery to meet some of these personalities. 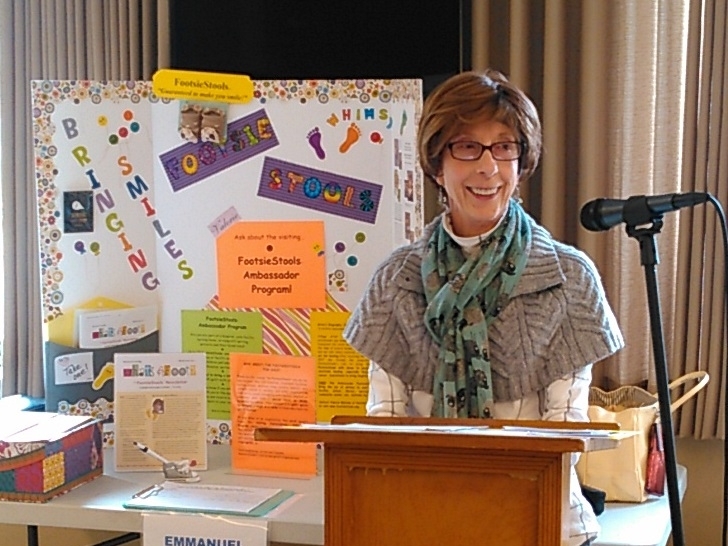 Speaking events focus on the arts for healing and therapeutic humor, and typically are offered with exhibits and/or sole collage workshops. These unique events prove ideal for churches, clubs, schools, and libraries. Topics are always tailored to particular audience interests as well as specific age groups. SUBSCRIBE TO OUR NEWSLETTER "WHAT'S AFOOT?" Sign up with your email address to receive updates on our latest events and creations! FootsieStools Ltd. promotes the arts for healing and therapeutic humor.